When we were kids, my sisters and I were obsessed with a movie called Practical Magic. Sandra Bullock and Nicole Kidman were in their long-haired prime, playing two stunning sisters who happened to be witches. The soundtrack was filled (most appropriately) with Stevie Nicks songs like “Crystal.” The movie was just the right balance of heartwarming and terrifying, and watching the two close-as-crap sisters run around in an old, crickety house hit pretty close to home for us. What does this have to do with food, you ask? Well, the first time I walked into Walton’s, the first thing I thought of was that movie. Walton’s is the sister restaurant to Sandra Bullock’s Bess Bistro (there will be a post on that place, that’s for sure), but it’s association with the lovely Ms. Bullock isn’t necessarily why it reminded me of Practical Magic. 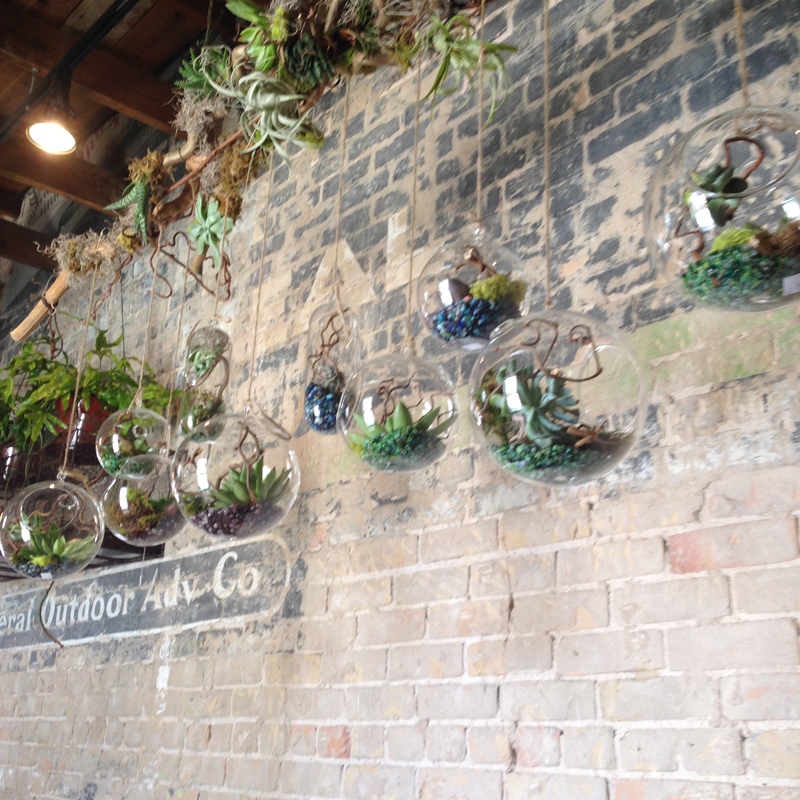 Maybe it’s the succulents hanging from the ceiling in different-sized glass globes. Maybe it’s the “garden” of fresh flowers against an exposed-brick backdrop. If you’ve seen the movie and seen that gorgeous greenhouse at the aunts’ house, you might see my point. If you haven’t, well, I apologize for the last paragraph. My first meal at Walton’s was a takeout salad and a croissant-turned-cinnamon roll. My mom picked it up for us as we moved my stuff in. I remember being intrigued by the dressing and caramelized pecans and being super happy with the cinnamon roll. But to enjoy Walton’s, you have to go to Walton’s yourself. Weekday lunches guarantee a line, but I didn’t mind. On a random Tuesday, I stood at the end of a 15-person line and ogled the beautiful display case of pastries, tarts and chocolate treats. I admired the just-the-right-amount-of-frills menu board: white text on black “chalkboard.” I got really, really excited about the dash of southern on the menu. I decided between their breakfast-all-day, blue plate special or sandwich options and settled on the Turkey Sweet sandwich the second I read “onion apple chutney.” And it was everything. First of all, the sandwich is on a croissant. Extra butter usually sells me pretty quickly. 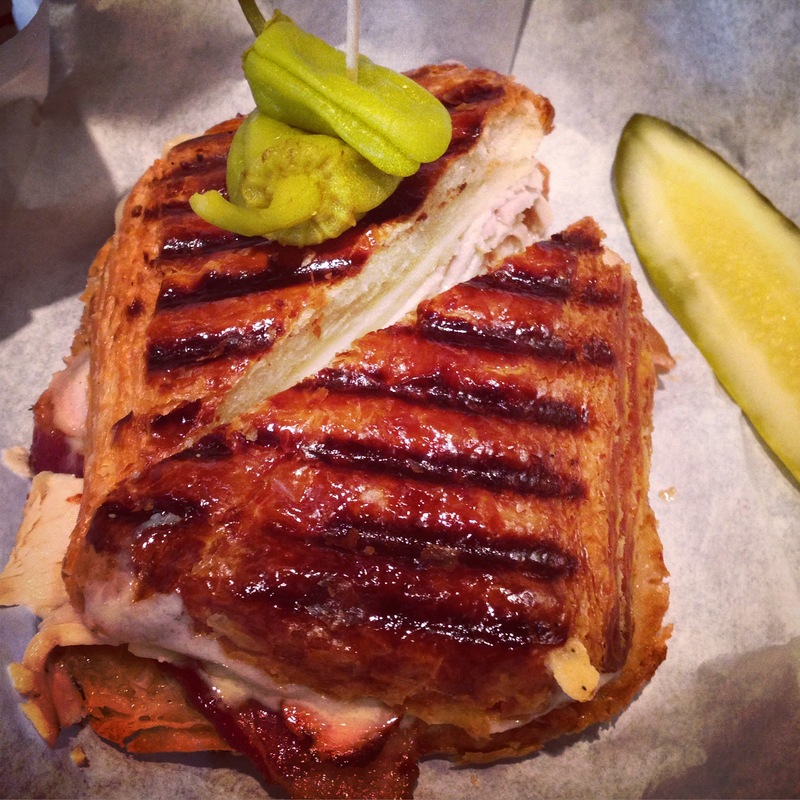 But the Turkey Sweet at Walton’s is more than its backdrop; it features fresh sliced turkey, applewood smoked bacon, white cheddar, maple aioli and that effing chutney. It’s so good, you guys. Get it pressed (pictured above) and you won’t be able to concentrate on anything else than the food in the your mouth. I hovered over it like an ogre and inhaled the thing in record time. During an equally pleasant weekday lunch, I ordered the freebird chicken sandwich. Not as orgasmic as its sweet sister, but I applaud the great multigrain bread and the jalapeno aioli. It’s quality. I need to explore their breakfast options further because I wasn’t crazy about the breakfast sandwich. Everything piled on it is on point, but the cute little biscuit is SO dry–not the kind you want for a sandwich. It is the kind of biscuit you want, however, with a little of their housemade strawberry jam, found by the iced tea and lemons. I’ve been tempted to steal a few of those little plastic containers more than once. Sitting and eating at Walton’s is just plain pleasant. It’s beautiful and feminine and perfectly fuses Southern quaintness with European class. Is it a great mother-daughter-grandmother-aunt place? Sure. But the food is good enough that you should bring everyone you know. Just not during my lunch break. The line’s long enough, thanks.